John Hubbard was born in Ridgefield, Connecticut (USA) and read English at Harvard. Having completed military service in Japan where he discovered his interest in Chinese and Japanese art, in 1956-58 he studied at the Art Students League in New York and with Hans Hofmann in Provincetown, Massachusetts. He lived in Rome for two years before settling in Dorset in 1961 where he lived and worked for the rest of his life. John Hubbard died in January 2017 aged 85. He was a much-loved friend to this gallery. John Hubbard visited England for the first time in 1958 and, with the abstract expressionism current in New York fresh in his mind, went to St Ives and met the painter Peter Lanyon. From 1960 onwards he has concentrated on a kind of landscape painting which goes beyond the depiction of appearance, alluding to natural forms, to the rhythms of growing things and recreating the experience of being in a particular place. In Dorset his interest in oriental painting and thought and the early influence of artists such as De Kooning, Mark Rothko and Mark Tobey became linked in his mind with the contemplation of the natural world. He has felt a particular affinity with the visionary art of Samuel Palmer, in 1969 exhibiting charcoal drawings after late Palmer watercolours. He has tended to work in series – in Greece, Morocco, France, in his own garden in Dorset, in the gardens at Abbotsbury and Tresco and the Alhambra, Spain. He makes sketches and charcoal drawings in the open and works in the studio on larger charcoal drawings and the paintings, with their extraordinary sense of the dramatic and subtle effects of light and colour. The image of the garden has been consistent theme in his work. 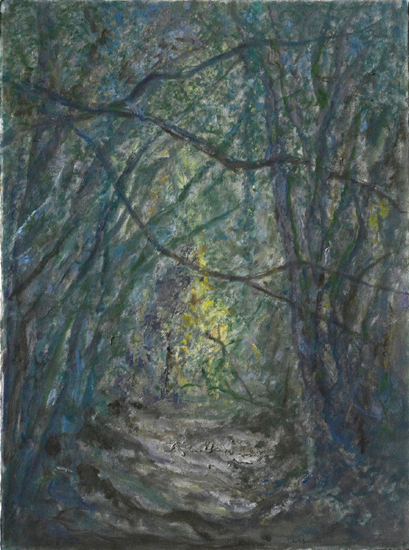 John Hubbard’s work is in major public and private collections around the world including the Art Gallery of Ontario, Philadelphia Museum of Art, the National Gallery of Victoria, Melbourne and Yale Center for British Art and in the UK in Tate, the Arts Council Collection, British Council, the Scottish National Gallery of Modern Art and the Victoria and Albert Museum. He has had solo exhibitions at the Fitzwilliam Museum, Waddesdon Manor, Modern Art, Oxford, the Ikon Gallery, Birmingham, Luther Brady Gallery at George Washington University, amongst many others as well as an exhibition of twenty five years of drawings at Kew Gardens. Below are some of the paintings John Hubbard showed at Sladers Yard.